Before anyone can start the highly anticipated Super Bowl betting, the NFL must figure out which two teams will represent their conferences for the title. 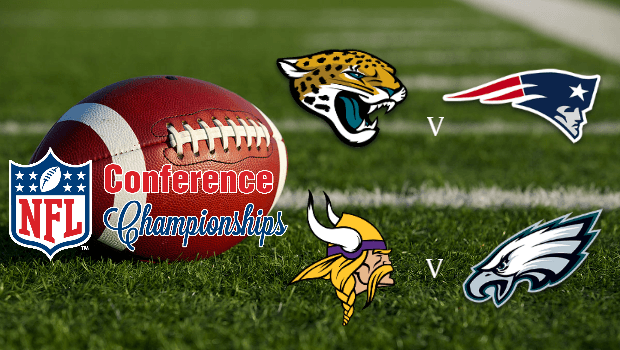 The NFC and AFC Conference Championships are jammed packed full of value bets in 2018 so our experts have put them altogether along with their advice to ensure punters capitalize on the huge betting weekend this year! When betting of the NFL in general, it's important to consider the range of markets offered on any one game, including the player prop markets and the money spread market, both extremely popular in American sports betting. But betting major NFL Playoff matchups like the Conference Championships means an uptick in market coverage and bookie scrutiny which can't be ignored. The NFL season is always full of drama covered in 24 hour news cycles by the relentless US media so it's completely expected the story lines for the Conference Championship weekend to be more inflamed than the already overwhelming regular season coverage. This week's headlines were dominated by one particular match up thanks to some unexpected developments with star players on both sides. First we have the Jacksonville Jaguars' star, rookie running back Leonard Fournette getting rear-ended while driving around town in Jacksonville. Fournette was unharmed but he did tell reporters the driver who hit him was actually a Steelers fan, the team Jacksonville beat last week to reach the AFC Conference Championship. Fournette confirmed that had nothing to do with the very clear accident. It seems the Jacksonville's star will be fine and ready to play Sunday but certainly keep an eye on any developments between now and then. The other story line might actually affect some betting strategies for this weekend, though. Apparently, Tom Brady experienced some sort of hand injury that New England has no interest is discussing, a typical move by the Patriots ogranization. The potential 2018 NFL MVP and 5-time Super Bowl winning QB missed Thursday's practice and was limited on Friday. He wore a glove so the media wasn't able to get much of an idea about the injury and obviously Brady and Belichick had little to say. Punters need to keep a close eye on this headline even if it's just a minor injury; the lines have already been moved and it could effect Brady's play. Looking at the NFC matchup, Kyle Rudolph's total receptions market at Bet365 is worth looking into. The Vikings and their budding young QB could look to the veteran TE releasing against a very aggressive Philadelphia pass rush, even if it's just as a safety valve for a few yards. Bet365 is offering odds of 6/5 Rudolph grabs over 4.5 receptions, which for a key target and then potential safety value in the game, that's not much. Last week, Case Keenum and the Minnesota Vikings had all but lost as the clock ticked below :20 seconds and they trailed the New Orleans Saints. Then, an absolute miracle occurred as Stephen Diggs scampered past a whiffed tackle by safety Marcus Williams to score a 61 yard game winning touchdown. Obviously the Vikings have a ton of big play potential so TopBetta offering Keenum as longest passing play of the weekend at odds of 3.50 is worth considering. TJ Yeldon, the backup RB to Fournette, could see some third down action against a Patriots defense who's not been particularly good at covering backs out of the back field. Bet365 is offering odds of 8/11 that Yeldon get over 30.5 yards of both receiving and rushing yards combined. A few successful rushes in reliefs of Fournette and one big pass play for Yeldon isn't unfathomable against New England. The Jaguars are clearly underrated as they are featured in both are value bets in terms of player props for the AFC. Although the Jaguars passing game has its limits, injuries to key receivers have given Marqise Lee a chance to shine and shine he has the last few weeks. TopBetta is pushing him down into the middle of the pack in terms most receiving yards so his odds of 15.00 could be a ton of value. Although not the most popular among Americans, the outright market might present some serious betting value with the Jacksonville Jaguars being offered at odds of 9/1 with Ladbrokes. The Jags put up 45 points last week on Pittsburgh's heralded defense and has been among the most elite defensive units themselves all year. Obviously New England has the upper-hand in experience but Jacksonville is extremely confident. The Eagles' offense is not what it once was when the then-leader for MVP, QB Carson Wentz, was at the helm but their odds of 13/1 over at Unibet to be the highest scoring team this weekend are worth a look. Philadelphia's team, both offense and defense, is loaded with studs and has a great chance to beat Minnesota, so outscoring them obviously. The other matchup, if Brady is hobbled, could be relatively low scoring. Obviously traditional sports betting will be by far the most popular way to engage this weekend's action but punters should not forget to consider what value daily NFL fantasy presents for this weekend. Playing DFS during the playoffs when there is a limited player pool can create the exact betting opportunity shrewd punters are looking for. Feel free to check out FanDuel to enjoy some NFL playoff daily fantasy!